TRB Tripura STGT & STPGT Result 2018: Teachers’ Recruitment Board, Tripura (TRBT) published the STGT & STPGT result on its official website (trb.tripura.gov.in) today. Candidates who appeared in STGT & STPGT examination can check their results through below given links. Candidates can check their Subject wise STPGT result through the above-given link. TRB uploaded Subject wise Bengali, Biological Science, Chemistry, Commerce, Education, English, Geography, History, KokBorok, Mathematics, Mizo, Music, Physics, Political Science, Psychology, and Sanskrit result at trb.tripura.gov.in. Teachers’ Recruitment Board, Tripura (TRBT) also uploaded the schedule for certificate verification process. 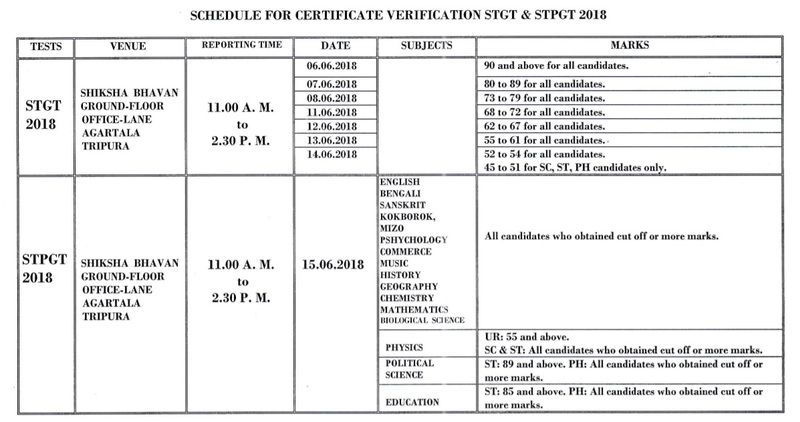 so candidates who want to verify their STGT and STPGT certificates should note the schedule and verify their certificates accordingly.